It was a warm, cloudy day here in the Northwest with large contrasts of rain (see figure below of the observed 24-h precipitation ending 7 PM Thursday): over 3 inches in the Olympics, but only light rain over the lowlands, and a few sprinkles across the basin of eastern WA. 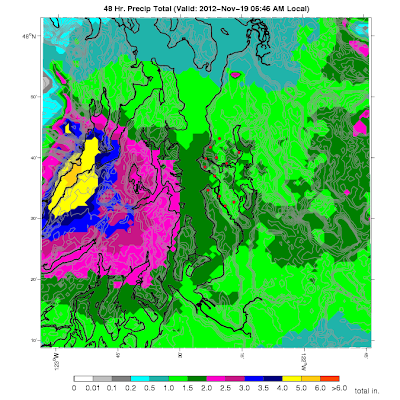 Why so little over the Cascades but lots over the southern slopes of the Olympics? The key reason is that the flow aloft was southerly (from the south) and you can't get good upslope on the Cascades from the direction. But you can get good upslope over the south-facing slopes of the Olympics. But the real precipitation story is to our south, over southern Oregon and northern CA, where some locations got over four inches (pink color) and over two inches was commonplace. But this is just the beginning. With a large low center center over the NE Pacific and persistent strong flow pushing eastward to our south, northern CA is going to get hammered during the next several days. Take a look at the latest UW WRF model precipitation forecast for the next 72 h: huge amounts, including over 10 inches in "favored" upslope locations. The Olympics and north Cascades are also wet. From weather satellites that measure atmospheric moisture, we can see the narrow plume of water vapor...an atmospheric river..that has been feeding the California rainfall. 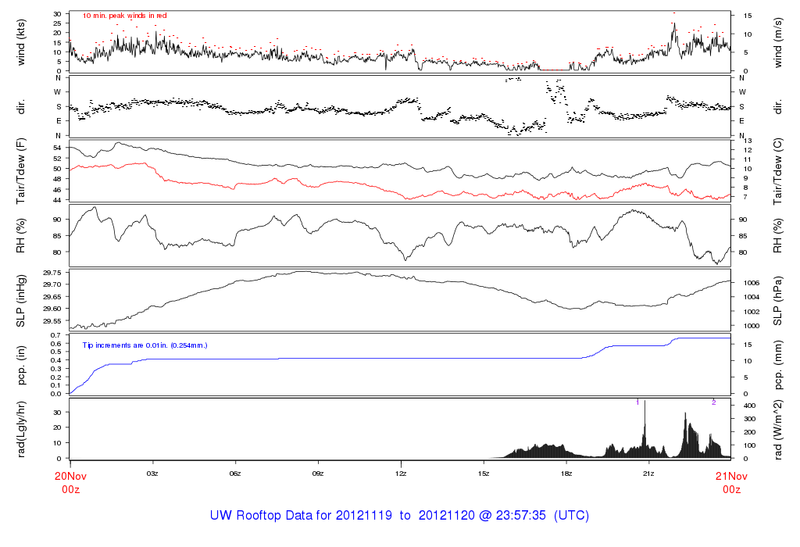 Tonight I will premiere a new figure created by UW WRF modeler Dave Ovens: 72hr snowfall! Lots (feet) of snow over the mountains of BC, and the higher elevations in the Cascades do very well indeed (foot or more). Most of the accumulation at pass and ski area elevation will occur later in the weekend as the freezing level drops and the wind direction becomes more westerly. The Sierra Nevada range goes to white (literally)--more than 45 inches of snow at higher elevations! The folks at Tahoe must be salivating. Here is a close up of the 72h snowfall ending on Monday at 4PM for Washington. Baker and Rainier will be buried. Stevens, at least a foot. Snoqualmie will pick up a half-foot or so. Not sure whether it will be enough to allow them to open. During the day the difference in pressure across the Cascades has increased as pressure has progressively fallen over the Pacific. Right now the difference is around 7 hPa and rising, and such an offshore-directed pressure gradient is associated with increasingly easterly winds. To illustrate, take a look at the sea level pressure forecast for tomorrow (Wednesday) at 10 AM. An amazing large and intense low pressure area over the Pacific. In fact, it appears to cover virtually the entire NE Pacific! This offshore pressure gradient will get an added boast as a weak low pressure disturbance, embedded in this giant low rotates around near us. There are several places that will get a good blow from this: offshore over the eastern Pacific, along the western WA foothills (hello Enumclaw, Black Diamond, and North Bend), and along the western portions of the Strait of Juan de Fuca. 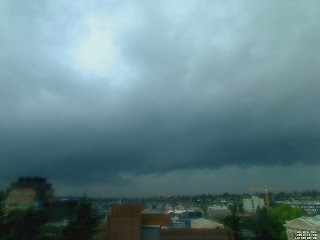 And later in the event NW Washington get strong winds. Lets look at the last WRF surface sustained (not gust) winds for the next day. First, 4 AM tomorrow (Wed). 20 kt sustained in the foothills (some folks will get gust to 40), and accelerating winds in the Strait, with sustained 25+ kt near Tatoosh Island. This is not a good set up for extensive, strong winds in the foothills--the wind are not easterly aloft at crest level. 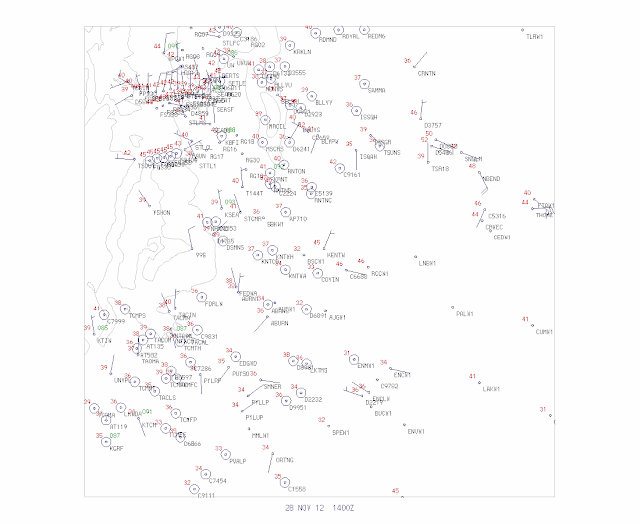 By 4 PM tomorrow, 30+ kt over the western Strait and similar winds northeast of the Olympics. 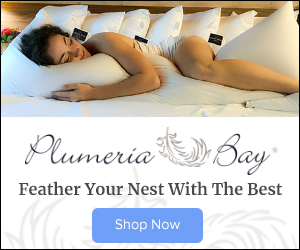 Those poor, sunburned folks in Sequim will get now be getting some wind burns as well. Too windy for golf. The western Strait can be very windy during such offshore flow, with air accelerating towards the west. Strong winds, lots of rocks, and often clouds/fog make this region very dangerous for marine traffic, and, in fact, there have been numerous shipwrecks there, giving it the appellation of "Graveyard of the Pacific." During the days of sail (1830-1925) there were 137 major shipwrecks in the immediate vicinity of the entrance to the Strait. A major and tragic example is the 1906 shipwreck of the Valencia, with the loss of nearly 150 lives (see graphic). 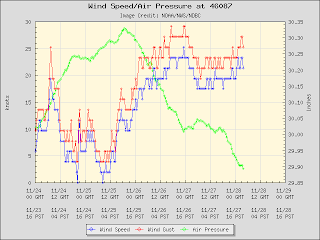 The National Weather Service has a buoy in the middle of the western entrance to the Strait (46087)...here are the recent wind and pressure observations there. 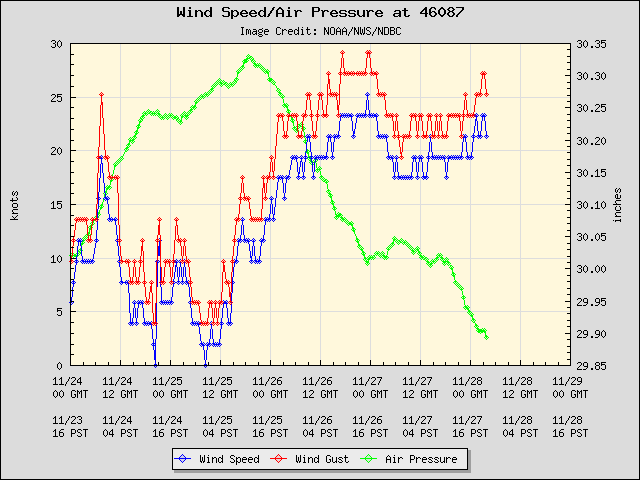 Pressure is falling quickly and wind have increased to about 25 kt...and will increase further tonight. Rain returns tomorrow afternoon, but with this large low over the NE Pacific, most of the flow will go south of us into southern Oregon and northern CA. Here is the forecast precipitation for the 72 hr ending Saturday at 4 AM. Huge amounts over northern CA. Snow? We will have relatively warm, southwesterly flow so Snoqualmie is out of luck. Very marginal for Stevens. Want snow? You will have to go to Baker, Crystal, and Whistler. One of the reasons I keep this blog going is the wonderful feedback from you, the readers, including the images some send me. Yesterday, another one came in: a very rare triple rainbow. 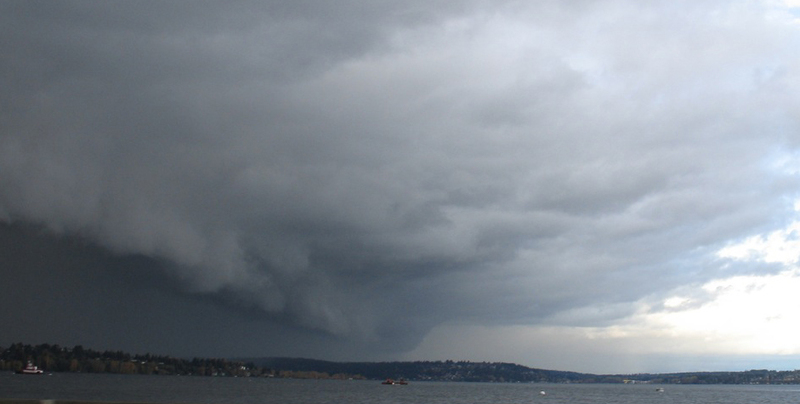 Here is the picture provided by Anna Jensen-Clem, taken around 3:15 PM Saturday in Kenmore just south of the intersection of 68th Ave NE and Bothell Way. You start by noticing two parallel bows than curve upwards to to the right. These we see all the time. 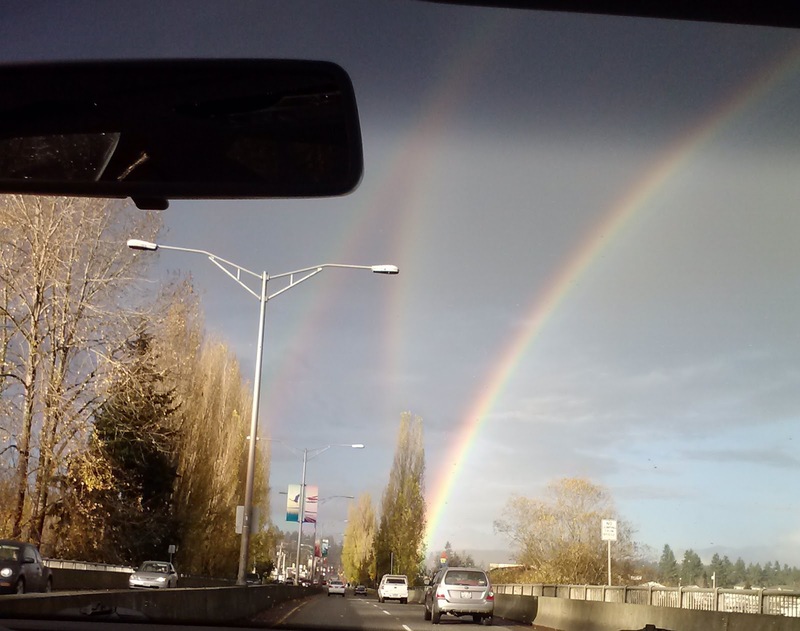 The brighter one (to the right) is the primary bow and the second one (to the left) is the weaker secondary bow. If you are very observant you will notice that the colors are reversed on them. But there is another bow, considerably dimmer, that extends almost vertically from the primary bow, this is the unusual one. And a nice example of something I have read about, but never seen personally, a reflection bow. But what is it reflecting off? Let's figure this out! First, to get primary and secondary bows you need sun, rain, and the properly geometry. Looking at the Camano Island radar image at 3:16 PM, we can see the shower in question over the northern portion of Lake Washington. Got rain! 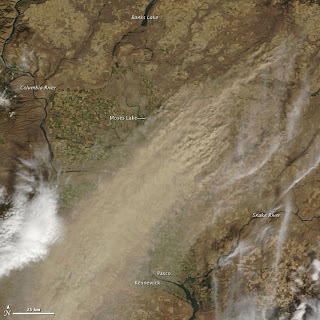 And the satellite image at 3:15 PM indicated it was mainly clear to the south. Got sun. So what about that rare extra bow photographed by Ms. Jensen-Clem? 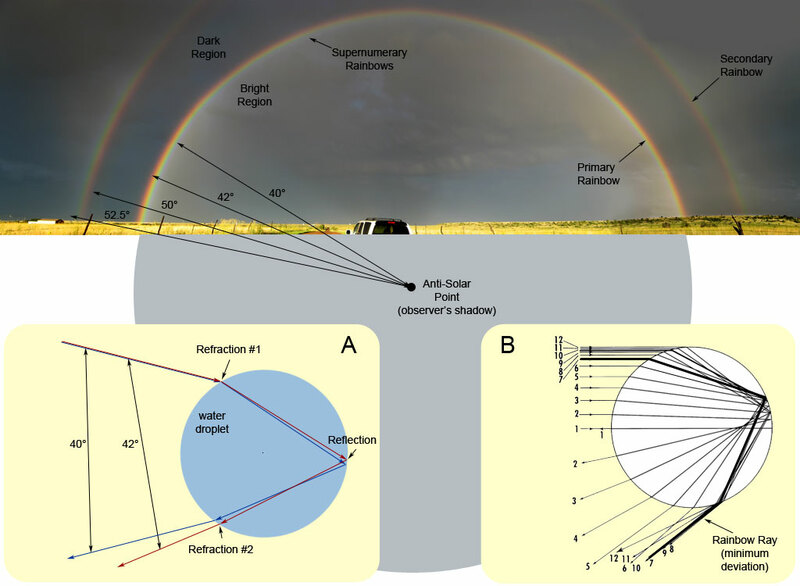 The sun causing it appeared from the same direction as the primary bow but the bow is higher in the sky, which implies the sun would be coming from a lesser angle. 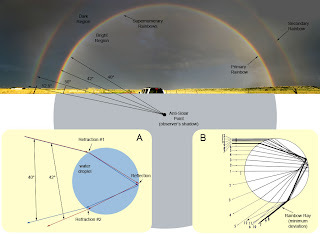 This is a reflection bow, in which the sun's light is reflected off a water surface, thus coming from a lesser angle, and then producing a rainbow. To get the geometry right, you need to have the sun relatively low (something true at 3:15 PM in late November). Here is a diagram that shows what is going on. The yellow represents the rays coming directly from the sun and the red the reflected rays. The water obviously needs to be behind the observer. So where was the water for the Bothell bow? Here is a map of the region. The photo was taken a bit south of "A"--the intersection of 68th Ave. and Bothell Way. Lake Washington provided the reflection surface..the geometry is just right. 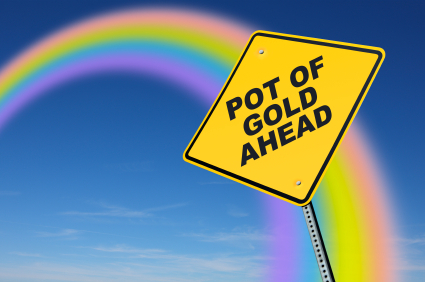 Finally, in a future blog I will tell you what many really want to know, particularly with holiday shopping season upon us: how to find the gold at the end of the rainbow. You also have to master dealing with Leprechauns, something we teach in our graduate classes in the department. Multiple-Car Collisions and Weather: Can We Stop the Carnage? 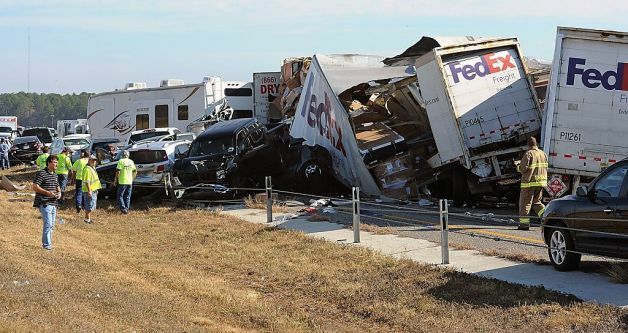 It has became an all too frequent news item: dozens or hundreds of cars involved in a huge pile up on some freeway or interstate. Dozens injured and several deaths. Tales of terror. Major roadways closed for extended period, with huge attendant cost. 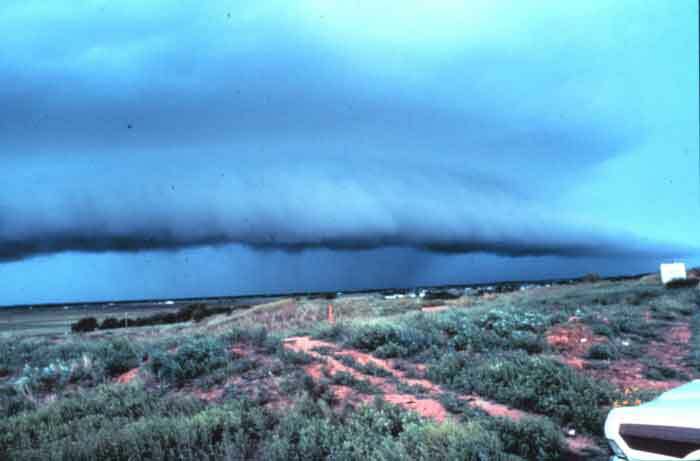 And most are associated with a reduction of visibility due to some weather phenomenon: heavy rain, fog, snow burst, smoke, or dust. 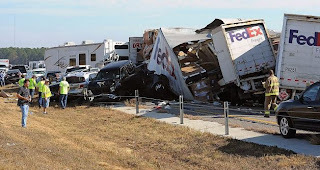 It happened again yesterday (Thanksgiving morning) on I10 near Beaumont, Texas and was associated with dense fog. Nearly 150 vehicles, 2 deaths, over 50 people sent to hospitals. Tales of screaming and narrow escape. And such event don't have to happen. 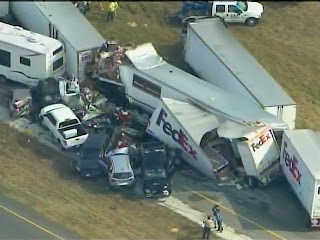 A portion of the Thanksgiving morning I10 accident. 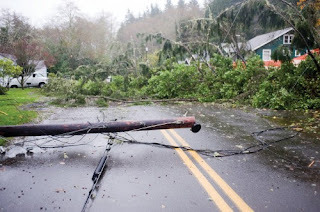 Such multi-car collisions have happened on many occasions here in Washington State and I believe that new weather and communication technology can substantially reduce their frequency. (5) Intense road glare when the vehicle exits a rain area into bright sunlight. The driver slams on the breaks when he/she loses visibility and then other vehicles, too close to stop, crash into the first vehicle. Vehicle after vehicle crashes into the growing pile up. You can search news using google and bing and you will find hundreds of examples of such weather-related multiple car accidents. How do we stop these disasters? I know, a big issue is that drivers often follow too close and too fast for the weather conditions (or ANY condition). 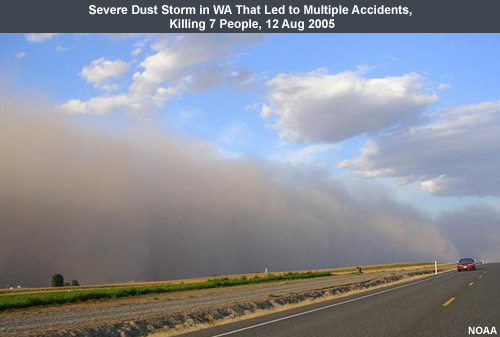 Perhaps we need more vigorous laws about following distance and speed limits that depend on weather conditions. It will be difficult to enforce, but I am certainly willing to see some action in this direction. But there are some technical solutions that are possible, particularly now that we have massive amounts of weather information available, many folks have smartphones, there are reader boards and flow control on a number of highways, and soon many cars will have internet capability. Consider an example. There have been a number of big accident pile ups here in Washington as a heavy convective cell crossed I5 late in the afternoon. Drivers here are used to rain, so they keep their speed up (probably too fast). Then they exit the convective precipitation and bright sunshine reflecting off the bright roadway blinds a driver who slows abruptly. A big chain reaction accident ensues. We can reduce the number of these events. We have radar imagery that can be used to predict when heavy rainfall will cross the road during the next hour. We know where the sun is and whether clouds will block the sun. It would be easy to determine if a risk exists or WILL exist soon. 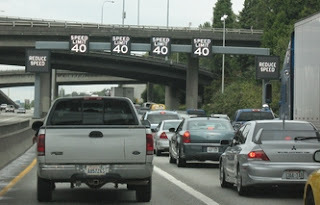 I5 has lots of reader boards that could warn drivers to slow down-- in fact, they can even change the speed limit in real time. This could have a huge impact on stopping such urban pile ups. I put in a proposal to WSDOT to build such a capability...wasn't funded unfortunately. What about smoke or fog on the roads? We have satellite imagery that provides a real-time view of the distribution of these hazards. Here is an example of "fog imagery) for the accident area yesterday. And satellite imagery can show dust storms as well. 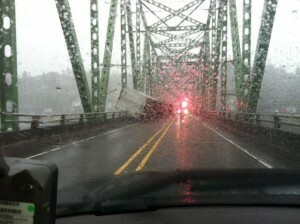 Here is one associated with a major collision event in eastern WA. And there are huge numbers of surface observing stations located on or near highways. Imagine a real-time system that looks for roadway threats, sends information to all available electronic signs, and sends messages to smartphones in the area? Folks could load a special warning app on their smartphones that would tell them when a serious threat is in front of them. 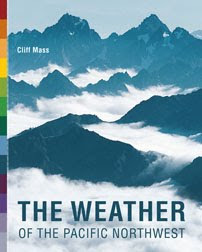 (calling all weather app developers!) Eventually (in a few years), nearly all cars will have internet capability and the warnings could be shown on the instrument panel. There are the collision prevention systems going into high-end cars these days that monitor following distance and automatically brake the car if a collision is imminent. That could help. Even more futuristic we could consider having the car slow down automatically during bad weather, either from information derived from sensors on the car or information it receives via the net). Perhaps insurance companies will give a discount to folks with this new system on their vehicle. Bottom line: the marriage of dense weather observations and weather imagery with new communications/control technologies can greatly reduce the frequency of multiple car pile ups...and there is a lot we could do today at modest cost. Sometimes a weather feature comes through that grabs your attention, providing a sobering reminder of the power of the natural world. 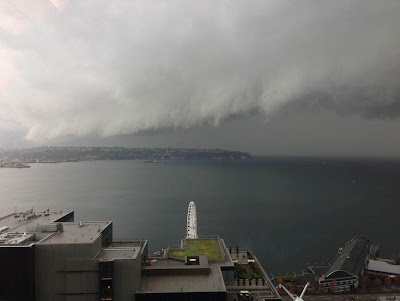 Yesterday, we got hit by such a feature--an intense convective line that brought strong winds, intense rain, and a cloud feature that was nearly biblical in appearance. First, a picture, graciously provided to us by Peter Loron, of the line as it was approaching downtown Seattle (time: 1:30 PM Thursday). Looks like the end of the world. Picture courtesy of Peter Loron. Looking towards W. Seattle from downtown. Would have been fun to be on the big white wheel! Or scary. You see that linear appendage hanging below the main cloud base? 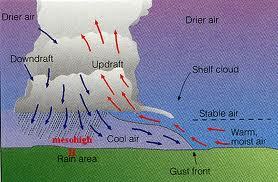 Those threatening clouds (also known as shelf clouds) are found along the leading edge of the gust front; cool air descends out of the cumulonimbus cloud and forces air in front of it to rise, producing the cloud (see schematic below). For your viewing pleasure, here is another dramatic shelf cloud. We could see the convection (big line of cumulonimbus clouds) in the Camano Island radar image at nearly the same time (yellow is heavy rain, red is VERY heavy rain or hail). There was one lone lightning strike (over north Seattle as this feature went through). 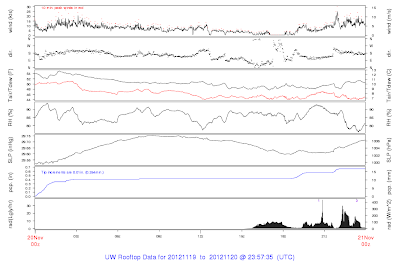 As it went past the UW, the winds gusted to 30 kts, the wind directed shifted to southwesterly, heavy rain fell, pressure jumped, and temperature fell (look just past 21z on the UW rooftop observation plot below). One interesting aspect of this feature is one could follow it from offshore, using the Langley Hill radar. Here is an image at 10:48 AM Tuesday...clearly apparent offshore. Hopefully, during the next year we can extend Seattle RainWatch to include the Langley radar to provide an automated heads up for features such as this one. Well, if heavy rain was not enough, hurricane-force winds--stronger than the winds during Hurricane Sandy--hit our coastal areas today. 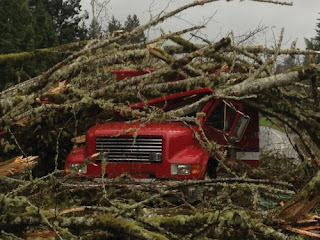 Several sites had wind gusts above 100 mph, including 114 mph at Naselle Ridge on the southwest Washington Coast (sustained winds reached 77 mph). Or 111 mph at nearby Abernathy Mountain. Both of these sites are at roughly 2000 ft. But even sites near sea level got blasted. Much of the southwest Washington coast and Oregon coast had wind gusts to 60-80 mph with extensive power outages and damage. The high resolution models suggested a significant wind event, although they underplayed the intensity and northern extent. Here is the wind gust forecast from Sunday morning for 7 AM this morning. 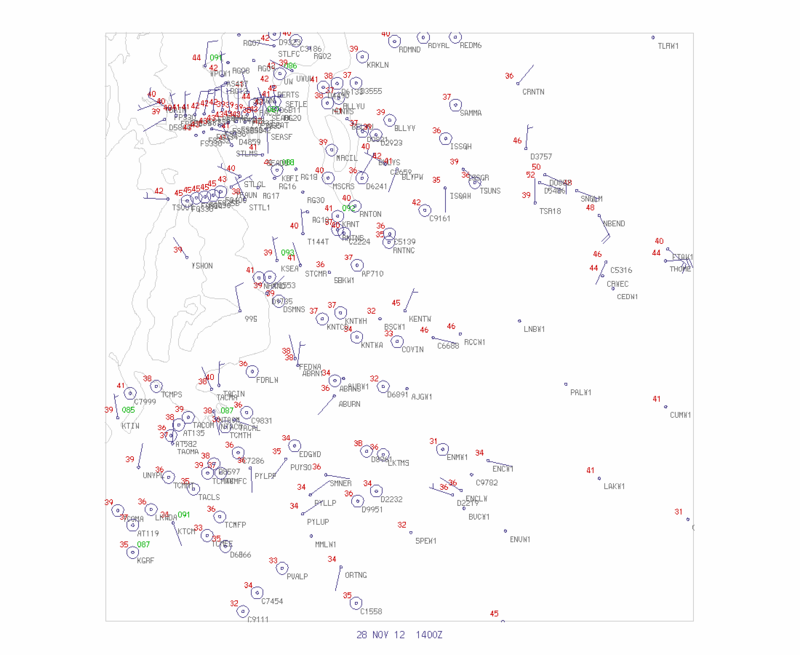 Some 70 kt winds. The reason the model underplayed the event was an inability to correctly simulate a small scale low center that moved towards the central WA coast. The Langley radar showed it in real time, though. Now the good news. After two modest systems pass through tomorrow and Wednesday, Thanksgiving Day looks fairly dry. And the next system on Friday/Saturday has weakened compared to major event predicted a few days ago. No big snowstorms this week, but enough more to allow Baker and Crystal to open. 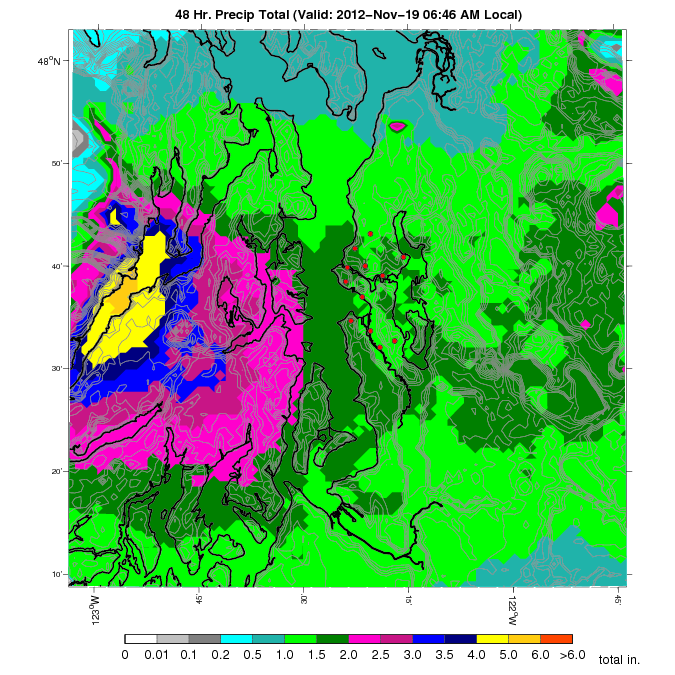 and here is the last 48-h precipitation from Seattle RainWatch. 1.5-2 inches over the city and 4-6 inches over parts of Kitsap/Hood Canal. The latest 24-h precipitation amounts (ending 8 AM) show 5-6 inches over the SE side of the Olympics and over the mountains of SW Washington. Lesser, but still heavy, amounts now falling over the western slopes of the Cascades. The latest Northwest River Forecast Center update shows a number of rivers at flood stage...particularly over SW WA and NE Oregon....some at moderate flood. This is going to get worse before it gets better, since the latest run shift the precipitation more northward...which is confirmed by the Langley Hill radar. Here is the latest storm total from Langley Hill. 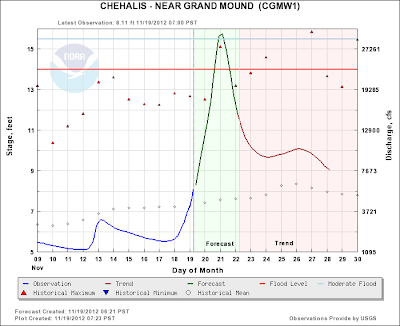 Roughly 6 inches over the mountains of SW WA and heavy rains on the southern and western sides of the Olympics...the Chehalis will rise quickly with such input. 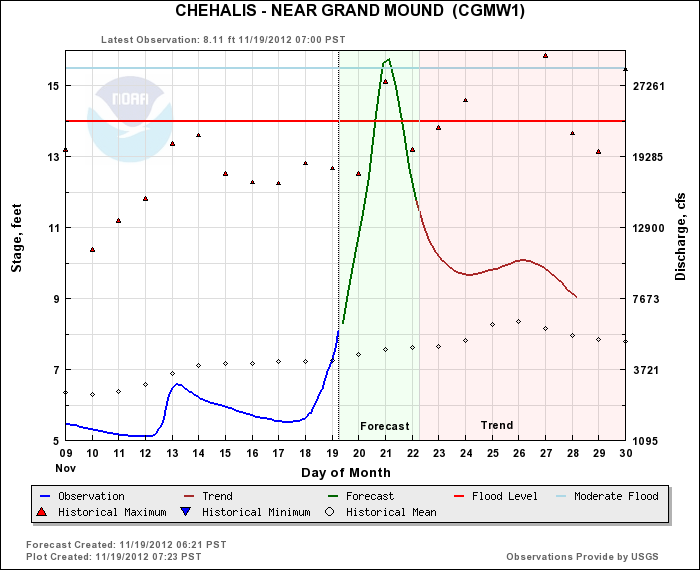 Here is the latest hydrograph (past and future flow levels) for the Chehalis at Ground Mound from the NW River Forecast Center. They are going for 15.5 ft...substantially level than the all-time record (20.7 ft during the December 4, 2007 storm). I assume they are looking carefully at the Langley radar and updating their inputs regularly to their hydrological models. THIS is when the new radar will pay for itself. We can be proud of living in the wettest portion of the lower 48 states as well as the area of the world's greatest annual snowfall (Mt. Baker). But we are also world class in precipitation contrasts. Today is a good example. Here are precipitation measurements over the 24-h ending 9 PM Sunday evening. On the southern and southeastern sides of the Olympics they got hit by 2 to 3 inches of rain, while virtually nothing fell on much Lopez and San Juan Island. Not much more on northern Whidbey. 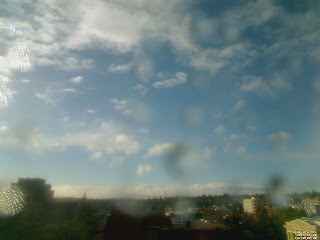 In fact, the rain shadow extended as far a Bellingham! 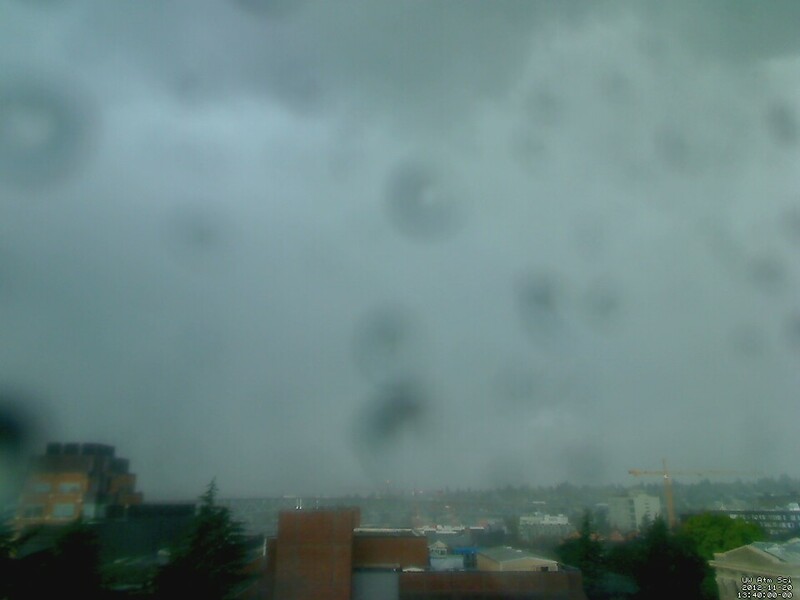 There is some variability in the downstream extent of Olympic rainshadows and this is on the big side. 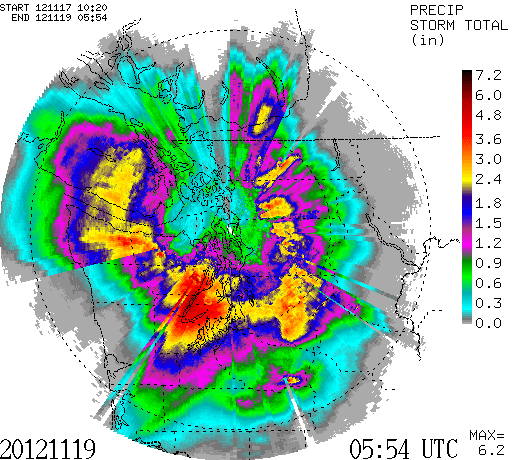 For the next 24-h it looks like the heaviest rain will hit SW Washington, the southern WA Cascades, and NW Oregon (see graphic), although it will be respectably wet everywhere. Save Stampede Pass Weather Station! Another Major Storm for the Northeast U.S.